One Sunday morning, a very hungry caterpillar pops out of an egg. He starts making holes through the book’s pages as he feasts on various kinds of food throughout the week. 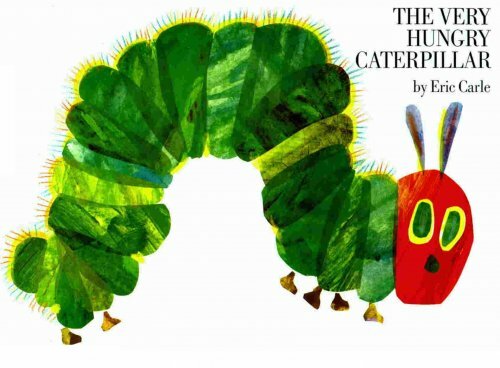 The hungry caterpillar eats everything from fruit to chocolate cake! As the week goes on, he gets bigger and fatter as he eats more and more food. Finally, he decides to build himself a cocoon, and he soon emerges as a beautiful butterfly. This classic book has been used to develop children’s speech and language skills for generations. The simple and repetitive text which makes it an effective book for teaching counting, days of the week and a variety of different food. The Very Hungry Caterpillar follows a predictable sequence, so it's perfect for developing young children’s sequencing skills. For further speech and language targets in The Very Hungry Caterpillar, see the list below.